Do you need an internet connection? 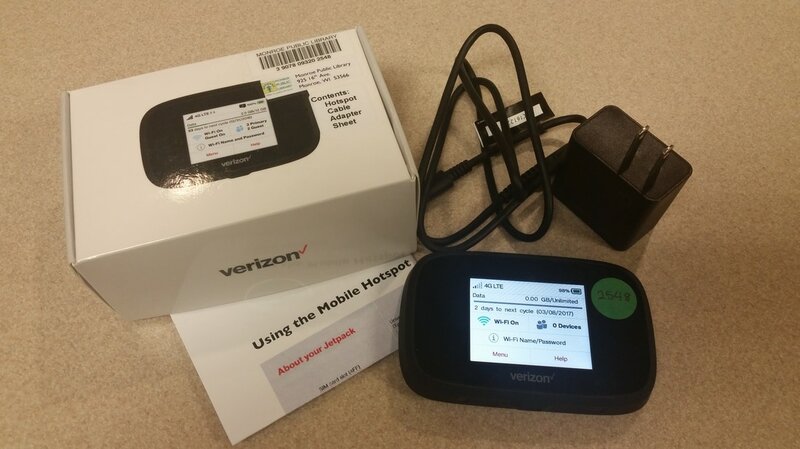 Check out a mobile hotspot! The hotspot provides wireless internet access that you can use at home. Checkout is FREE for 7 days, with a $1.00 a day overdue fine. Ask at the Checkout Desk if you would like to borrow the hotspot. The hotspot may not work with all devices, and may not provide reliable internet service in all areas. The hotspot is not meant as a replacement for home internet. Please do not use for Netflix or other streaming entertainment. You may check out the hotspot for one week. You may check out the hotspot only once in a four-week period. The hotspot is available on a first-come, first-served basis for those who are eligible to check it out. Availability of the device does not supersede the above rule. You must have a library card and be 18 or older to check out the hotspot. Please return the hotspot to the Checkout Desk and not in the book return. If the hotspot is overdue, service will be suspended and the device will not work. If the hotspot is overdue, you will be charged $1/day overdue fine.